thanks, guest blogger Tom Medvetz! Let’s thanks Tom Medvetz for an edifying and entertaining series of posts that include the genesis of his research question, cinema trivia, and his thoughts on blogging as part of the academic enterprise. Readers can enjoy his posts here, here, here, here, and here. 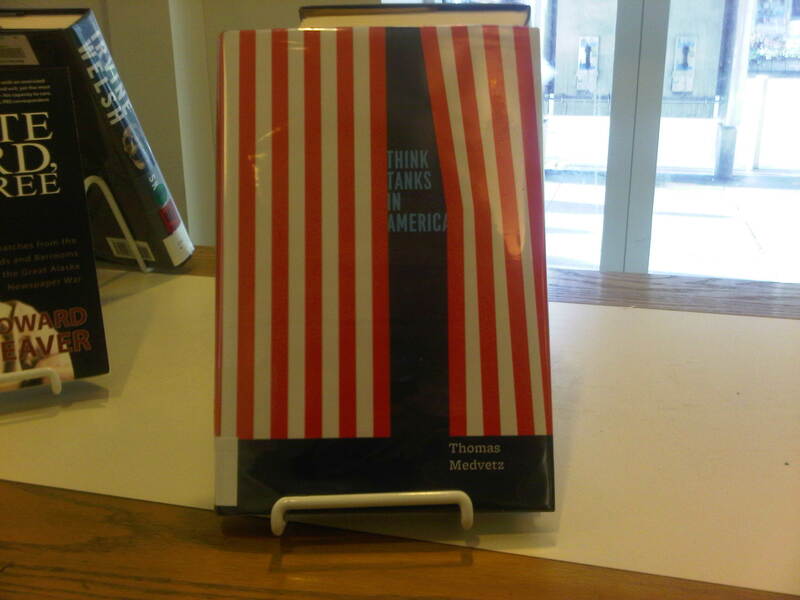 Read more of Tom’s work in his book Think Tanks in America (2012, University of Chicago Press) and his journal articles. You can also follow Tom on Twitter at @tommedvetz. (1) First, I made the far-from-novel observation that any attempt to make meaningful statements about “intellectuals,” public or otherwise, is fraught with all kinds of analytic, theoretical, and conceptual difficulties—the main ones being linked to the concept intellectual itself (and its closest kin: e.g. experts, pseudo-intellectuals, etc.). As Zygmunt Bauman put it, “Any attempt to define intellectuals is an attempt at self-definition.”‡ In fact, you could plausibly argue that making a definitive statement about who “truly” counts as an intellectual is in a sense the ultimate intellectual act inasmuch as it presupposes a kind of meta-level knowledge about what “real” knowledge is, who really has it, etc. In my own work, this opposition became relevant when I asked where the think tank category came from. Limits of space prevent me from explaining fully why this is a puzzle in the first place, so for the most part you’ll have to trust me. But very briefly: part of the issue is that many of the organizations that we now call “think tanks” (e.g.­­ Brookings, CEIP, CFR, NBER) emerged in the 1910s and ‘20s, decades before anyone classified them as members of the same organizational “species.” Other complexities aside, it wasn’t until the 1970s that the think tank classification developed in anything resembling its present day form, with postwar military planning groups like the RAND Corporation becoming the early prototypes—and the older, Progressive Era-groups getting lumped in afterwards. In the book, I argue that the think tank classification formed as the result of a merging together of two sets of organizations with competing claims to expertise on matters related to public policy. On the one side were some of the aforementioned organizations, which had by the 1950s claimed for themselves important roles in economic, social, and foreign policy-making affairs. In the absence of a formal technocratic arm of the state, groups like Brookings, CFR, and RAND were centrally involved in devising the social programs of the welfare state, supplying technical assistance to the defense industry, staffing the economic administration, helping to broker deals between management and labor, and so on. Of course, the right- and left-wing critiques of technocracy took on very different forms and had different targets. For the New Left, it was the image of the Cold War military planner that became the key symbol of technocracy run amok. (Read the Port Huron Statement for its denunciation of professionalized rationality—or watch the movie Dr. Strangelove for its caricaturized representation of a crazed military adviser.) For conservatives, the main technocratic villain was the New Deal welfare state planner. (Read the Sharon Statement for its denunciation of “government interfere[nce] with the work of the market economy”—or watch the movie Brazil for its dystopian vision of a suffocating state bureaucracy. )§ In both cases, the argument was that technocratic experts had become too powerful, too unaccountable to the public, and too consumed by their own professional self-interests. Villainy we can agree on: Deranged nuclear scientist Dr. Strangelove (left), a character often said to have been based on Hudson Institute founder Herman Kahn, and a faceless bureaucrat from Terry Gilliam’s Brazil (right). For me, the idea of the field of expertise became useful as a tool for understanding what happened next. First, it’s important to recognize that both sets of activists faced the same paradox inherent in any attempt to challenge “expertise”: Put simply, to try to undermine the authority of an expert is already to claim for yourself a kind of expertise. It should come as no surprise, then, that with virtually no credentials or academic titles to speak of and no recognized body of authoritative knowledge at their disposal, activists on both sides established hundreds of new nonprofit research centers that served a kind of self-credentialing function. In my formulation, the activists became “activist-experts.” In the language of field analysis, they pursued a strategy of closure by attempting to “certify” their knowledge and constitute themselves as experts of a new breed. Among the best examples are the Institute for Policy Studies and the Worldwatch Institute (on the left) and the Heritage Foundation (1971) and the Manhattan Institute (1978) (on the right). The growth of these organizations had major effects for their technocratic predecessors, which increasingly found themselves under scrutiny for their public unaccountability, their secrecy, and their supposed self-interestedness. In the theoretical language I’ve used, they faced a problem of too much closure. Accordingly, they began moving “vertically’” toward the center of the field of expertise by “opening up” their knowledge. Organizations like Brookings, CFR, and RAND, having once tried to operate entirely “behind the scenes,” increasingly sought media attention, produced shorter and more accessible writing for the general public, and expanded their memberships. The result was a kind of structural convergence. Notice that this framework allows us to avoid any essentializing labels for either set of organizations. In fact, the main point is that to the degree that the activist-oriented groups succeeded in getting their policy recommendations taken seriously by politicians (i.e. in becoming political “insiders”), they became more “technocratic” themselves. And vice versa: to the degree that the more technocratic groups engaged in public outreach, they became more like the activist-experts. The overarching result of the convergence, I argue, was that the organizations became increasingly interconnected, more oriented to one another in their judgments and practices, and more focused on common goals. By the 1980s, the distinction between them had become muddier—and the political folk category think tank was born to describe all of them. What does all this have to do with the debate about “public intellectuals”? First, it suggests a wholesale reframing of that debate. The term public intellectual itself is best understood, not as referring to a flesh-and-blood individual, but to a theoretical position in a space of relations. Second, it suggests that the period since the 1960s has been marked neither by the “demise of the public intellectual” in any simple sense, nor by the opposite process (i.e. the flowering of public intellectuals), as others have argued. Instead, it has been marked by the appearance of a new intellectual figure known as a “policy expert.” Commentators who celebrate policy experts as “public intellectuals” invariably overlook the severe economic and political constraints they face in conducting policy research. On the other hand, commentators who lament the “death” of public intellectualism typically romanticize the late 1950s and early ‘60s as its golden age. This was the era of John Kenneth Galbraith, C. Wright Mills, David Riesman, and Richard Hofstadter. However, if the germ of a public intellectual project was incubating then, it represented the lesser of the two developing challenges to technocracy. Furthermore, the project’s failure cannot be explained in terms of a simple retreat by scholars into the “ivory tower.” Unlike the structural convergence between technocrats and activist-experts that gave rise to the “policy expert,” the relations among academic scholars since the 1960s have been marked by divergence. Whereas some took the path of “hyper-professionalization” (to quote Steve Shapin), others opted to imitate the style of the “policy expert.” Yet others still have persisted in a civic-intellectual mission—only to face a double-marginalization: first, from American public debate, and second, from the mainstreams of their own disciplines. Meanwhile, the main cause of this divergence, and the primary obstacle to the development of a viable civic-intellectual tradition in the US—viz. the institutionalization of “policy expertise” through the blending of activist and technocratic styles of intellectual production—has gone largely unnoticed. * Much like blog posts themselves, blogging-sabbaticals are inevitably quite short. 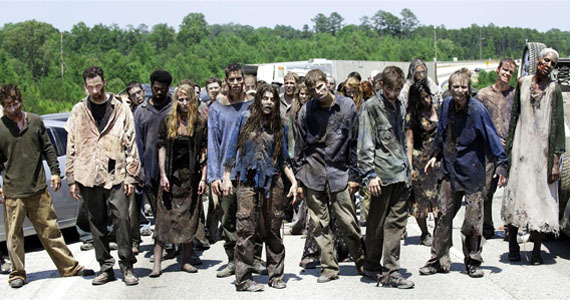 † In retrospect, I should have incorporated a zombie angle into the book—zombies currently being a surefire path to the bestseller list. ‡ Zygmunt Bauman. 1992. “Love in Adversity: On the State and the Intellectuals, and the State of the Intellectuals,” Thesis Eleven 31: 81-104. Quoted in Jerome Karabel. 1996. “Towards a Theory of Intellectuals and Politics.” Theory and Society 25: 205-233. Hi, Tom Medvetz here, checking in with my fourth OrgTheory guest post (posts 1, 2, and 3 here). Today I’ll sketch a few notes about one of the big issues my book speaks to: the complex relationship between social knowledge and public action in the US. Perhaps the best-known debate on this topic is the one associated with Russell Jacoby’s 1987 book, The Last Intellectuals, which famously lamented the disappearance of “public intellectuals” from American life. In the years since its publication, Jacoby’s book and the idea of the “public intellectual” have earned enormous attention from journalists, pundits, and scholars. A second glance at this debate reveals a likely reason for the disagreement. Put simply, there has never been any consensus about the proper definition of the term public intellectual. In fact, it’s fair to say that how a given writer operationalizes the term tends to determine where he or she stands on the issue. Hi, Tom Medvetz here with my third guest installment for OrgTheory. * In this little excursion, I’ll extend the “Dude, where’s my social theory?” discussion that’s been percolating on the site over the last couple of months. The main points of that conversation, which originated with Kieran Healy’s August 22 post and continued more recently in Fabio’s posts (here and here) were that: (1) the category “theorist” seems to be disappearing as an occupational position in American sociology, and that (2) fewer sociologists identify themselves as theorists. As a consequence, many people are not sure what, from a disciplinary point of view, theory in sociology is supposed to be any more, or how it should be done, or what if anything distinguishes it from intellectual history, or philosophy, or normative political theory, or humanities-style ‘Theory,’ or mathematical modeling. I agree—this is probably true. However, it’s worth pointing out that semantic confusion is neither a necessary nor a ubiquitous feature of the shift being discussed. Furthermore, when we start to think about what it means to “do theory,” the discussion takes on a different cast and the issue of “theory’s” status as an occupational position becomes secondary. Of course, the popularity of the JTS doesn’t contradict the fact that there are fewer jobs for “theory” specialists. But it does raise another question already anticipated in Kieran’s post: Who are these people, and what do they mean by “theory”? On this general topic, Kieran writes that, “Crudely, the sort of people who once would have thought of themselves. . . primarily as theorists now think of themselves as sociologists of culture instead, or (less often) as disciplinary historians of ideas.” Is this true? Certainly there’s a lot of overlap among these areas—theory, culture, and the history of ideas—in terms of ideas and personnel. Nevertheless, I think there remains, both in the JTS events and in other work done under the banner of “theory” today, a coherent mission that’s not reducible to the sociology of culture per se, or to the history of ideas. It’s also something that can’t be expressed in terms of an opposition between “theoretical” and “empirical” work. I’m referring to the specific focus on the task of analytic construction, including the work of formulating rigorous concepts, historicizing the categories of one’s research (not for its own sake, but as an ongoing feature of their implementation), and taking into account their social effects. And I’d submit that the level of appreciation for these things in American sociology is more important than the specific fate of “theory” as a subdiscipline. I can clarify this point by returning to the topic I’ve been discussing on this blog: think tanks. Doubtless the two most common questions I get about my research in this area are: (1) “Which think tanks did you study?” and (2) “Would you consider [organization X] a think tank?” These are both perfectly good questions, and they have something important in common: they’re both fundamentally about category boundaries. The first question is essentially, “What is the boundary of your study?”, and the second is, “What is the boundary of the think tank category?” The only thing I don’t like about these questions is that there’s no easy 30-second “elevator version” answer to either of them. That’s because one of the contributions of my study, as I see it, is precisely to build a rigorous analytic concept of a think tank that lays bare some of the hidden features of the reigning political folk concept. I say ‘build a rigorous concept,’ but I don’t mean build from scratch. In my case, this has meant applying and extending existing sociological concepts like network and field. And while space limitations prevent me from going into detail here, the conception of a think tank that I develop in the book is decidedly “practice-oriented” (to use a fashionable phrase): To be a think tank, I say, is to become ensnared in a never-ending game of separation and attachment vis-à-vis the more established institutions of academia, politics, business, and the media. Think tanks must constantly signal their “independence” from these institutions, on which they depend for resources, personnel, and legitimacy, even as they use their associations with each one to mark their putative separation from the other institutions. It’s from this idea that I develop a description of “policy research” as a hybrid practice of generating policy prescriptions while competing with other think tanks for donations, press coverage, and political attention. Why the need to be so “theoretical”? At one level, it allowed me to ask certain important but neglected questions about think tanks. By separating the analytic concept from the political folk concept, I could treat the latter’s growing use in American public and political life as something that needed to be explained. And because some of the organizations now included in the folk category predate the think tank classification by more than 60 years, the process I’m referring to isn’t reducible to a simple story of organizational creation. Instead, it was a complex process of network formation. The term think tank became meaningful only when a formerly disparate array of organizations became oriented to one another in their judgments and practices, and only when the members of this network developed novel intellectual products to separate themselves from more established institutions. (1) The status of sociological theory is different from its distinctiveness as an occupational position. I agree with the gist of the previous discussion as it appears in the posts I linked to above—and there’s nothing in it that contradicts this point. Nor would I deny the importance of the issue raised by Kieran and Fabio. Nevertheless, it seems to me that more relevant than whether or not “theorist” is in decline as an occupational position are some other issues anticipated in Kieran’s original post: inter alia, how strongly do American sociologists appreciate the importance of constructing rigorous analytic concepts? Do we reward those who take seriously the effects of classification systems, including the ones used by social scientists? Is it mandatory or merely optional to subject the conceptual dimension of your own work to relentless self-questioning? The presence or absence of people who specialize in these things might be indicators of theory’s health or sickness. But insofar as we’re all theorists, it’s not a perfect one. (2) I ♥ empirical data. The notion of “theory” I’m suggesting here (which is far from original) isn’t built on an opposition between “theoretical” and “empirical” work. In fact, in my own experience, being “theoretical” has meant having to gather more data, not less. Or, to be blunt, I didn’t spend two years in the swamp of Washington, DC visiting dozens of think tanks, interviewing their staff members, rooting through their archives, building a database of the educational and career backgrounds of over 1,000 think tank-affiliated policy experts, attending their public events, and even finagling my way into some of their private ones—like some kind of low-rent Irwin M. Fletcher—to be labeled “non-empirical” (if that’s what’s implied in the term “theoretical”). 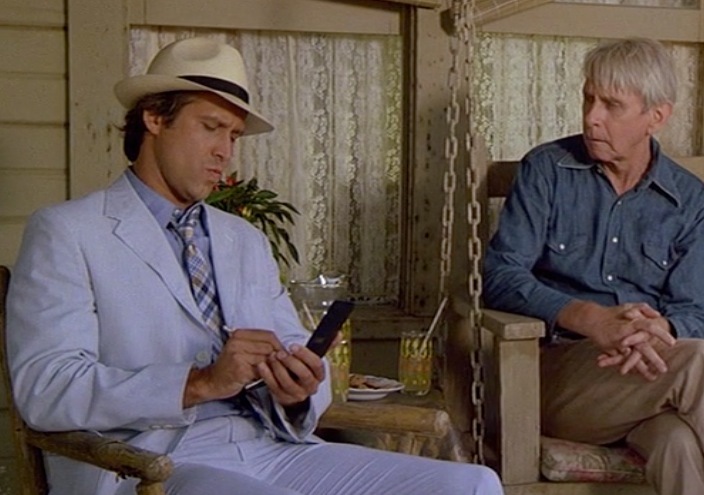 The author (left, in disguise) gathering empirical data. * My first and second posts can be found here and here, respectively. † My own connection to the JTS is as follows: I presented at the event in 2008; I co-organized it with Michal Pagis in 2011; and I attended all but one of the others. Questioner: Which think tanks did you study? Me: The book is partly a study of the think tank category itself, by which I mean its emergence in public and political life, its changing boundary, and the historical conditions that made the classification possible. Questioner: Ah… got it. Now go back to your Parisian café, Derrida. § I fully grasp the key methodological question raised here: viz. If the think tank category is constitutively fuzzy and always in flux, as I say, then how does one decide which organizations to leave in or out of the study? This will/would have to be a topic for another post, but (very) briefly, the working solution in my case was to sample from various locations in the organizational network, including its center and periphery, and then to consider more broadly how this network was situated within bigger social structures. Hi, Tom Medvetz here with Round 2 of my guest stint at OrgTheory. Against all odds, some sort of “think tank chic” seems to have developed in the U.S. in recent years.§ How should we interpret this? And in general, how might we think about a think tank’s role within the broader social relations of power? On these questions, consider again the Council on Foreign Relations, whose current membership roster includes luminaries from the worlds of business (e.g. Richard Branson, Frederick W. Smith)¶; media (Roger Ailes, Rupert Murdoch, Oprah Winfrey, David Geffen, and Brian Grazer); academia (political scientist Peter Katzenstein, economist Martin Feldstein), and politics. In the latter category are numerous former National Security Advisers (Zbigniew Brzezinski, Henry Kissinger, Colin Powell); past and present Supreme Court Justices (Ruth Bader Ginsburg, Sandra Day O’Connor); and former Secretaries of State (Madeleine Albright, Hillary Clinton, Condoleeza Rice). I agree with the elite theorists on two key points: first, that class interests have a clear primacy in shaping the social relations in which think tanks are embedded; and second, that most think tanks are (and always have been) unambiguously elite in their composition. What’s my quarrel with the elite theory approach, then? Two things: In the first place, I’d point out that while most of the key figures in the think tank world are indeed elites (however you like to define the term), their organizations never simply represent the “ruling class” as a whole—only specific fractions of it. Put differently, after a certain point, the breadth of the elite concept becomes a major hindrance. The more we expand our notion of “the elite” to include all of the relevant fractions, the less we can simply take for granted their affinity. Which fraction(s) of the elite think tanks represent, and in what proportions, are always the relevant questions. Second, the modality of the encounter among think tank-affiliated elites is never one of simple harmony, but also one of “horizontal” struggle. Specific elite subgroups collaborate in the making of think tanks, but often in the context of struggles against other elites. Even within specific think tanks, cooperation often accompanies internecine struggles for control over an organization’s agenda. Both of these points suggested to me the need for a more open-ended, historical approach. As I show in the book, the most influential think tanks of the postwar era (like the Brookings Institution) were built on partnerships of politically moderate capitalists, aspiring civil servants, and a technocratic fraction of the intelligentsia. In matters of economic policy, they were typically Keynesian—which, crucially, placed them in opposition to certain other elites, especially businessmen committed to an aggressively free market vision of capitalism and libertarian economists. However, the latter groups flooded the think tank arena in the 1970s and ’80s and became its dominant figures. In the book, I break with the Millsian approach by replacing the elite concept with the idea of the field of power. (Briefly, this is Pierre Bourdieu’s term for the social space in which powerful agents and groups collaborate and compete to determine which resources will be considered the most legitimate and valuable in modern societies.) Applied here, the purpose of the concept is to encourage us to think about think tanks as sites of collaboration and struggle among holders of various forms of power. At stake in the encounter isn’t just the accumulation of power (as the elite theorists would have it) but the relative values of its different forms (e.g. money, bureaucratic authority, political expertise, social scientific knowledge, and, increasingly, media access and publicity). * Shevardnadze was president of the republic of Georgia from 1995 to 2003. † Or so I gather from the extraordinarily convoluted Wikipedia synopses of the four Terminator films, three of which featured Schwarzenegger, and only one of which I remember actually watching from start to finish. More vivid in my memory, however, is Schwarzenegger’s synergistically brilliant appearance as the T-800 cyborg in the 1991 Guns N’ Roses video for “You Could Be Mine” (which was also included on the Terminator 2: Judgment Day soundtrack). 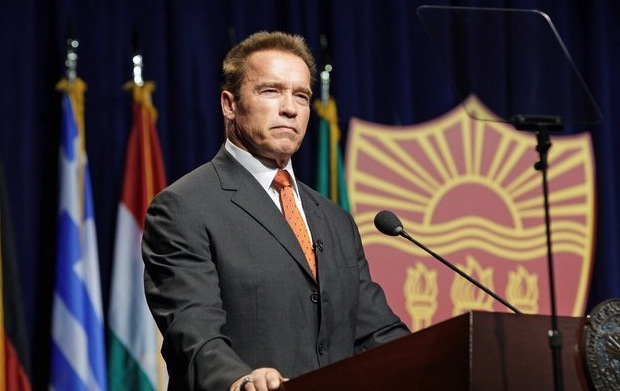 ‡ The quote is from “USC and Arnold Schwarzenegger Announce New Institute on State and Global Policy.” Retrieved on September 26, 2012. ¶ Not to mention CFR’s extensive corporate membership list. ** Nelson Polsby. 1983. “Tanks but no Tanks.” Public Opinion April/May: 14–16, 58–59. †† To be fair, Ms. Jolie has served as a United Nations Goodwill Ambassador, a role that was critical in securing her CFR membership. On the other hand, I have no idea what Warren Beatty did to earn his invitation to CFR (or whether it involved Carly Simon). Greetings OrgTheory readers—I’m Tom Medvetz, sociologist at UC-San Diego. My thanks to Katherine Chen and the other site members for inviting me to write a few guest posts now that my book Think Tanks in America has come out. I’ll discuss some particulars of the book in later posts, but I want to start out with some broad context. To adapt C. Wright Mills’ language, “mesearch” means stopping your car on Autobiography Avenue somewhere short of the intersection with History Road.† It’s undeniably a term of abuse—and a fundamental one at that—the suggestion being that the work in question is more memoir than social science. No social scientist wants to be accused of having done mesearch. DS: I believe that Erving [Goffman]’s entire corpus is crypto-autobiographical, [starting with] his early article on manipulating class symbols that he wrote when he’d dated Schuyler. . . who came from a high society. AD: Yes, and he was a guttersnipe. Now, whether or not Goffman was a “guttersnipe,” the suggestion seems to be that his scholarly insights about subterranean codes of meaning, hidden status struggles, and ulterior motives flowed directly from his own sensitivities and experiences. Put differently, Goffman’s greatness as a sociologist was built, not on a simple distance from mesearch, but on a complex flirtation with it. So if, as Loïc Wacquant has suggested, many sociologists enter the field “in reaction to a succession of ‘culture shocks’ at key junctures” in their lives, then my primary culture shock was my aberrant encounter with the world of higher education itself. This was where I first encountered “intellectuals,” by which I mean people who seemed to regard the accumulation of knowledge as a vocation in and of itself. If I were to tell you, then, that Think Tanks in America is ultimately part of my attempt to understand a social species that remained foreign to me even as I began the study—but also that the study was part of the process of certifying my own membership in that group (since it began as my dissertation), then am I guilty of mesearch? I hope not. I’m not a character in the book, and sociologists in general appear only as shadowy figures at the outskirts. Yet make no mistake: while the book focuses on a set of agents who currently overshadow social scientists in policy debates (viz. self-styled “policy experts”—about which I’ll say more later), my interest in the topic was driven by my relationships to both groups. 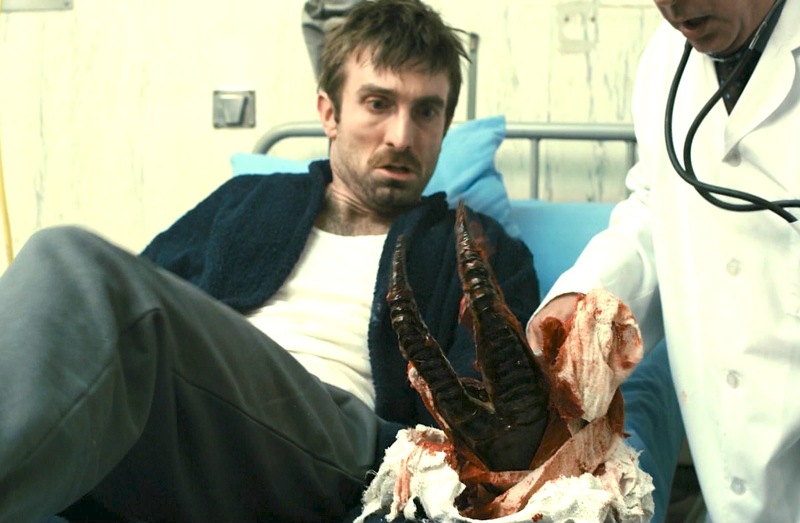 File photo: In the process of cataloging the properties of an unfamiliar species, a man (left) mutates into a member of that species. The questions remain: What’s the peculiar alchemy through which a set of deeply personal interests and motivations becomes a properly social scientific product? And where’s the line between research and mesearch? † Or if you happen to share Mills’ vehicular preferences: your motorcycle. 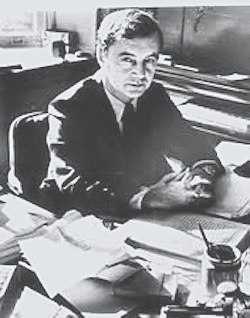 ‡ For a more nuanced picture of Goffman, see the wealth of materials (including personal recollections and interviews with friends, students, and confidants) available at UNLV’s Erving Goffman Archive. § In 1993, a pretax household income of $100,000 put the earner between the 90th and 95th percentiles in the American income structure.